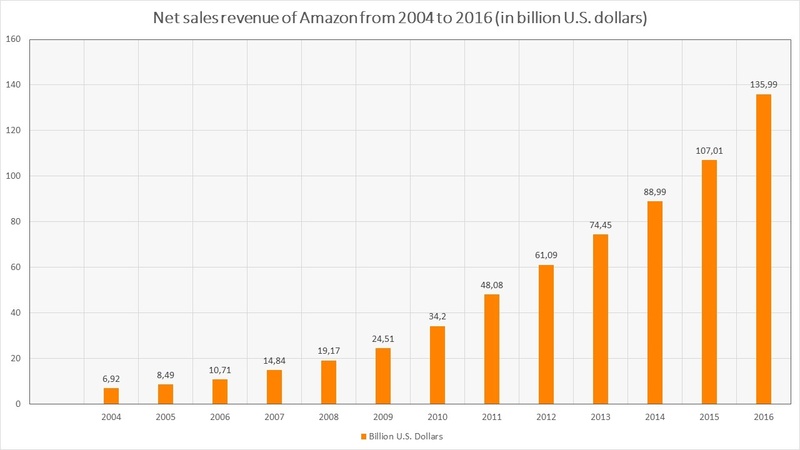 Amazon, one of the biggest online sellers that has started out as an online bookstore in 1994, has reached numerous target markets, one of them being logistics and its modernization. All the success is brought by the ‘Person of the Year 1999’, Jeff Bezos, the founder, and his team. In 2017, despite the rising expenses, decreased operating income, and the drop of its stock, Amazon’s revenues still rose from $37.2 to $38 billion in the second quarter in the result of jumped sales of about 25% year-over-year. The company does not emphasize the bottom line while still keeping a strong focus on financing a variety of areas. Amazon does not stop to surprise the public with its up-to-date inventions. In 2015, a new Amazon service of one-hour delivery has been launched in London. Currently, it is available in France, Germany, and Italy as well. To make this project successful, units should be held close to the place of delivery, which is the main reasoning behind Amazon’s hunt for 1300 small warehouses across Europe near the major European cities. Amazon takes advantage of a growing market of short-time deliveries by prioritizing its customers‘ satisfaction and their personalized journey. Another widely discussed Amazon’s logistic project named Prime Air has been created in its development centers in the United States, the United Kingdom, Austria, France, and Israel where drones were tested in multiple locations on its safety and speed. The idea of the project is to deliver products via air space within 30 minutes. While people still debate whether this is science-fiction or reality, Amazon assures that seeing Prime Air vehicles will be as normal as seeing mail trucks on the road. To accelerate these developments, Amazon has patented a type of warehouse to facilitate the loading of the drones. Beehive-like towers are supposed to serve as multi-level fulfillment centers for its delivery drones to take off and land. Amazon has high hopes for the project and believes that the new era will begin in the logistics market very soon. In 2016, sennder started to build its own platform that provides real-time pricing, customized reporting and live-notifications beyond track and trace. It helps cutting freight brokers and brings automation to the trucking process. Amazon has also announced the plan to build their own app connecting truck drivers with loads. It was expected that the number of Prime users would increase by 50% by the end of 2016, adding another 12 million members on top of the 17 million that have already been joining since 2014 – hence, increasing the need for a flexible and accessible infrastructure for same-day delivery. Certainly Amazon wants to make up for the annual losses in profits on same-day delivery exceeding $1 billion by creating their own logistics infrastructure. Yet, there have been no concrete statements on the status of this plan. Amazon’s investments in logistics will unquestionably leave prints in the industry, and it is only about time to know how big they will appear.